Cesc Fabregas has promised to do all he can to be fit for Sunday's Carling Cup final. The Arsenal skipper was withdrawn from Arsenal's 1-0 victory over Stoke City at the Grove on Wednesday night after just 14 minutes. Early examinations conclude he has a hamstring problem. 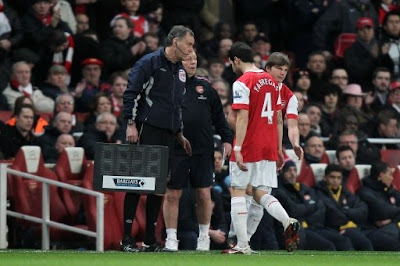 The midfielder will undergo a scan on Thursday to ascertain the seriousness of the injury. But last night, Fabregas told fans he would do all he could to be fit for his side's showpiece final at Wembley on Sunday. "I don't know if I'll make Sunday or not, but all I know is that from this moment to Sunday 16:00 I won't sleep if it's necessary. "I've waited too long to captain a final for Arsenal and I won't give up until the last second." "I have a lot of friends and family coming over for it [the Carling Cup final] - I know that I can become the first Spaniard to lift a major English trophy as captain and that would be something special. "Hopefully we'll all have a great day and be able to celebreate together by the end of it." After the victory which took Arsenal within a point of Manchester United at the top of the Premier League, Arsene Wenger said he remained hopeful Fabregas could recover in time.